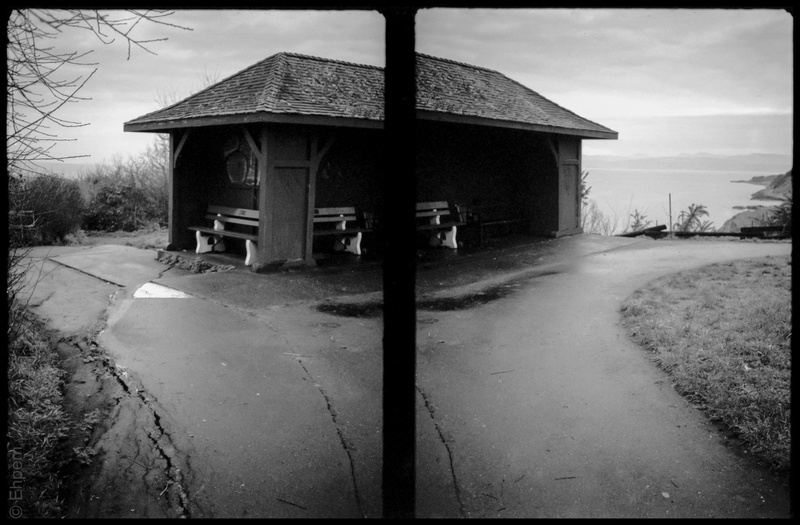 These three half-frame shot from the Olympus Pen are taken at the same place on Finlayson Point. The diptych and fliptych below are taken while sitting on the bench to the left in the shot above. They illustrate nicely three of the main methods I have been using. At the top is a panorama (not very well executed but kind of nice anyway), middle is the same scene transformed by moving subjects and at the bottom is an abstraction from rotating the camera between shots. I have not loaded film into the Pen up recently as I want to fix a light leak – I think the new felt seal I put in is not doing the job, but I am not totally sure if it is that part of the camera that needs attention, so diagnosis is underway but stalled by other commitments. Finlayson Point is within Beacon Hill Park on the waterfront. It has a long military history being used probably a thousand years ago as a fortress by the First Nations. The fort was of the trench embankment style with steep drops on three sides of the point and a trench (or two) cut through the isthmus of the peninsula, the spoil creating an bank on which a stockade was built. In the 20th century this spot served as a gun battery in defence of Canada’s west coast naval base in nearby Esquimalt. Now it is a park, and dog walking central for a large part of the Victoria population. Anyone else having trouble with the new design for editing WP posts? I can’t find a way to precisely scale my images and hence the bottom one is either too large for the screen I am working on, or way too small to be worth posting. Nothing in between. I wish the Happiness Engineers would stop engineering my unhappiness. 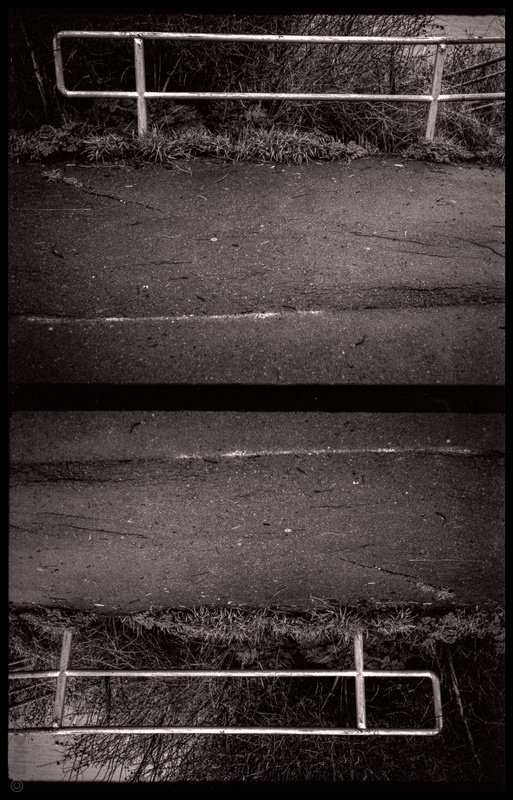 These continue my series of half-frame photos from the Pen. 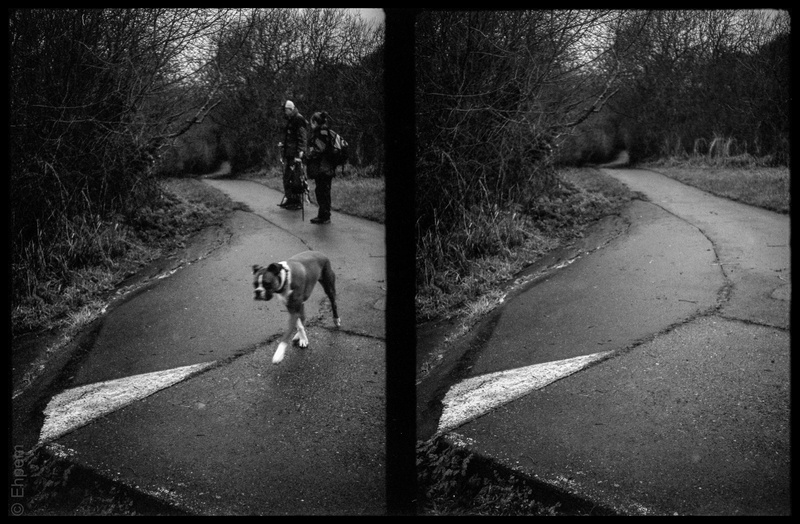 These are all adjacent shots on the film-strip, taken as multiple frames with the intent to scan as single images. Click on the photos to see them larger. Olympus Pen half-frame camera, 28mm 3.5 lens, Efke KB50, ISO50, 1/50th. love this diptych! more great half frame fun! nice emotion in this one for me! Thank you Mark. I am glad you commented on this post – getting fun and emotion into the same photo(s) is something to strive for.